In April 1966, I had my maiden darsan of His Holiness, Sri Sri Sri Ganapati Sachchidananda Swamiji. This extraordinary spectacle occurred in Kesare (Electric Company) Mysore. I had accompanied my beloved mother Smt Sharadamma, who had immeasurable faith in Guru Parampara (tradition). Smt Sharadamma was a devotee of Sri Shankaralinga Bhagavan, who had predicted that after His Samadhi, He will give darsan to His devotees in the form of Bala Datta. My mother’s inherent knowledge was that this young Swamiji was indeed her Guru. His picture had a tremendous influence over my family. Although, I was not an atheist (nasthik), I did not have the discipline to have devotion (Bhakti) to God or Guru. However, I was able to experience the joy of a God-communion in the presence and form of Sri Swamiji’s infinite divine personality for more than an hour. I got the impression that ‘He was the true torchbearer of Hindu renaissance’. My next encounter was on 06-06-1966. On this date the Ashrama was formally moved to the present location. The idyllic setting of the Ashrama was filled with trees and plants that were conducive for spiritual study and growth. Out of this He has built a modest but permanent Ashrama for the ever expanding circle of devotees. My subsequent visits to the ashrama were sponteanous. During our first meeting at the new Ashrama, Sri Swamiji narrated the glories of God and the need to serve Him. He iterated that God is the Only Reality and that He is omnipotent. We must enjoy or suffer the consequences for our actions, for attributing them to God is impious. Inevitable failures should never disillusion us. Quoting the life of Sri Rama, He showed that His life was a chain of total suffering, who not only made tangible material sacrifices, but also the more difficult renunciation of selfish motives, while merging His innermost being in a stream of humanity as a whole. He advised that every problem would lead itself to solutions if we are determined to make the law of truth and non-violence our law of life. Develop endurance, fortitude and be brave. My parents influence, and particularly, my mother’s inspiration and immeasurable faith in her Guru were the main instruments that brought this mangled body to the Lotus Feet of my Pujya Sadgurudeva. There was a silent spiritual awakening, an awakening that propelled me to look into my physical self. That self that has form and can be seem. My mother had strong desire for wanting me to pursue my higher education, and decided promptly to appeal to Sri Swamiji about my academic career and future course of action. But even before asking, His Holiness cautioned that I must continue my higher studies. Although I did not meet the eligibility criteria for acceptance into the program I got an invitation to join the post-graduate class. The first Navaratri celebration at the new Ashrama was in a small thatched hut. I was chosen to help in the Nava Aavarana Puja. He explained in detail, the significance of Devi Puja, the divisions of Sri Chakra as nine Aavarana, and the whole manifestation of Sri Raja Rajeshwari, which is nothing but the universal Cosmic Energy. He performed the Navavarana Puja chanting only Beejaksharas (seed letters) and moola mantras only. The flowers supply for the first day of the Devi Puja was totally inadequate, abundant amounts of flowers were required. As a student I was not in a position to procure this amenity, nor did I want to bother my parents with this burden. Anyway, I confided to my mother about my dilemma and to my surprise she was able to supply all the flowers needed for the next day Pujas. The lesson learnt from this; was that ‘we should use all our energy in serving Him’. Serving the Guru with unbounding faith will make the pathway easier to traverse. There is a reason and a time for every purpose under the Heaven. I realize that God/Guru is simple and everything else is so complex. In November 1996, Sri Swamiji informed me that he will visit our house in Jayanagar, Mysore. This information was not only a surprise but one of confusion and excitement. We proceeded to make all the arrangements for His visit. I made arrangements, with a taxi, for His travel to and from the house, which was about five kilometers away. Sri Swamiji bluntly refused the proposal and informed me that the cost for hiring the taxi should be given to the Ashram. He will walk to and from the house. As promised, His Holiness walked to the house with a few devotees. Divya Nama Sankeertana or Naadopaasana and nirthya (dance) are the simplest and easiest way to approach God for those in pursuit of Bhakti through music. Divya Nama Sankeertana or music gathering is an effective form of yoga or spiritual discipline necessitating intense concentration, and full absorption of the mind. Those were the messages that were parted from His lips on this occasion. Sri Swamiji, being fond of children, had taken a special likeness to my youngest brother, fourteen years old Radhakrishna (Swami Manasa Datta). They look into each other eyes with glowing tears and a blissful wave of cosmic love engulfed them. Did they recollect their association from previous birth? His Appaji then gently struck his forehead and blessed the house with a Vigneshwara idol that was manifested from the Bhiksha offered to Him. That moment was the beginning of Sri Swamiji’s teaching to us; the secret of balanced living. Unknowingly the spiritual dynamo in Sri Swamiji kept dragging me to the Ashrama everyday, although I was desperately trying to find employment. He said that one has to go through the laws of karma, and there was no way of escaping it. None can eradicate past karmas without worldly experiences. One day, in the midst of a satsangha program, at the Ashrama, Sri Swamiji called my mother and giving her a packet of vibhuti, candidly informed that she should immediately go back to her home. She was confused, but unhesitant obeyed. When she got home she found out that my father, an education officer, had an attack of paralysis and was hospitalized. My brother who is a medical doctor was treating him. He stayed hospitalized for eight days, and at home for one year. No one knows the wonder of Sadguru. In the packet of vibhuti that was given to my mother, lay the strength and confidence to face immediate problems. My parents were in search for a suitable match for my marriage. This decision I had not left to Sri Swamiji, but He suggested a match to which I did not consent. He informed that I should get into Chakra Vyuha (wedlock), and even though you have no confidence in My decision, I will be with you in choosing a suitable match, maybe in Bangalore. The marriage with Smt. Usha, from Bangalore was arranged on March 7th, 1973. Although He was not present at the marriage, He sent prasadam at the exact muhurtam. “Guru is always simple amidst the complexities of life”. Thirteen days after the birth of my son, Sachchidananda, in May, 1974, my wife was diagnosed with brain tumor. With the Grace of Sri Swamiji, she had surgery and was released from the hospital within ten days. His Holiness visited the house where she was staying after her discharge, and informed that we should perform Mrityunjaya Japa for thirteen days with purity and devotion. In April of 2004 just before leaving for the West Indies Sri Swamiji said that He was doing a special prayer in the Bangalore Ashram for someone who is going to become sick. With this he left India. Shortly after we had a fire at our home caused by the explosion of a gas cylinder; my wife suffered from burns to thirty percent of her body. She was admitted to the hospital and in addition to the burns she also suffered from diabetes. The first fifteen days was terrible for her. On the sixteenth day Swamiji was back in India and in Hyderabad, he called me by telephone and asked me whether my wife was alive or dead. I told him that she was in the hospital recovering. That same night my wife had a dream where Sri Swamiji was singing Devi bhajans and His body was covered with bandages. She woke up about 5am and told me of the dream. She was feeling much better. Later on we found out that in Hyderabad at the same time, Dr Phanishree who is Sri Swamiji’s physician, was attending to Him. He had itches and seem to be suffering some ailment, which Dr. Phanishree could not diagnose. 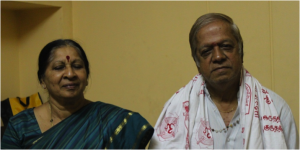 Swamiji was given sleeping pills to rest and he woke up at 5.00 am He told Dr. Phanishree that He was feeling better. Sri Swamiji had taken all the pain and illness of my wife on Himself and so saved her life once again. In Sri Sri Sri Ganapati Sachchidananda Swamiji’s leela, there is a lesson for everyone; the lesson of relationships. The relationship between Guru and Sishya is most intimate and not a business deal. This relationship is based on pure, unbounded and unconditional love, by the disciple who wholly subordinates himself to the Guru. I have witnessed many divine incidents since meeting with my Guru in 1966. I have suffered through many trials and tribulations. I have seen lots of doors open and close in front of me. I have incurred the wrought of some, but also indulged in lasting and meaningful relationships with so many souls, that what I am today could not have been without the fostering help of my Sadgurudeva Parama Pujya Sri Sri Sri Ganapati Sachchidananda Swamiji. Jaya Guru Datta. Man enters the world alone and leaves it also alone. All that happens, in between the womb and tomb is a big drama. 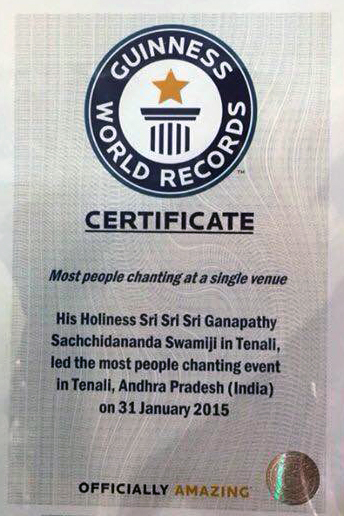 Wonderful recounting of your association with Sri Swamiji. Thank you. Your parent’s influence and particularly your mother’s faith in her Guru brought the entire family to the Lotus feet of Pujya Sadgurudeva !! Valuable article, lot to learn from you. Sri Guru Datta !! A great experience of my father indeed. Both my parents have been the pillar of faith towards Sri Swamiji. Their faith and devotion has surpassed all difficulties of life and have been abundantly blessed by His grace. Thank you mom and dad for showing us the right path of dharma and to follow and serve Sri Swamiji with utmost faith and devotion. Jai Guru Datta!! Jaya Guru Datta! I am so happy to read and admire my parents wonderful experiences with Appaji. I feel so lucky to share it with all the Datta devotees. Om Namo Hanumathe Namaha! God’ s ways always amazing and strange, i see once more how important it is to have faith and to follow Guru’ s words; thank you for sharing and a big hug to Sachu and Divya. Jai Guru datta. thank you dear Narashima for writing down you wonderful experiance. Greetings to Bangalore Ashrama from Switzerland. Great experience. The sooner we find GURU in our life the sooner we will be on ‘Spiritual’ path. You are so lucky you found your GURU so early in this life. Thanks for sharing your long association with the SADGURU. Jaya Guru Datta thank you for sharing your experiance with us.Om Namo Hanumatye Namaha. Jai Guru Datta! Dear Mr. Narasumha, It was wonderful to read your love and association with Guruji and his infinite love and compassion for his Datta family. Thankyou for taking time to share your life experiences with Guruji! These devotees experiences of Gurujis love is also like Nama Sankeertana Japa, that reinforces how he is there everywhere, showers his love to everyone. Jai Guru Datta! Om Namo Hanumataye Namah!